An overly plump atomic nucleus just can’t keep itself together. When an atom has too many protons or neutrons, it’s inherently unstable. Although it might sit tight for a while, eventually it can’t hold itself together any longer and it spontaneously decays, spitting out energy in the form of waves or particles. The end result is a smaller, more stable nucleus. The spit-out waves and particles are known as radiation, and the process of nuclear decay that produces them is called radioactivity. Radiation is a part of life. There are radioactive elements in most of the materials we encounter on a daily basis, which constantly spray us with radiation. For the average American, this adds up to a dose of about 620 millirem of radiation every year. That’s roughly equivalent to 10 abdominal X-rays. Scientists use the millirem unit to express how much a radiation dose damages the human body. A person receives 1 millirem during an airline flight from one U.S. coast to the other. But where exactly does our annual dose of radiation come from? Looking at sources, we can split the dosage in two nearly equal parts: About half comes from natural background radiation and half comes from manmade sources. Natural background radiation originates from outer space, the atmosphere, the ground, and our own bodies. There’s radon in the air we breathe, radium in the water we drink and miscellaneous radioactive elements in the food we eat. Some of these pass through our bodies without much ado, but some get incorporated into our molecules. When the nuclei eventually decay, our own bodies expose us to tiny doses of radiation. It’s no reason to panic, though. “The human species, and everything around us, has evolved over the ages while receiving radiation from natural sources. It has formed us. So clearly there is an acceptable level of radiation,” Rokni says. Any radiation not considered background comes from manmade sources, primarily through diagnostic or therapeutic medical procedures. In the early 1980s, medical procedures accounted for 15 percent of an American’s yearly radiation exposure—they now account for 48 percent. Growth in the use of medical imaging has raised the average American’s yearly exposure from its 1980s' average of 360 millirems to 620 millirems. Today’s annual average is not regarded as harmful to health by any regulatory authority. While medical procedures make up most of the manmade radiation we receive, about 2 percent of the overall annual dose comes from radiation emitted by some consumer products. Most of these products are probably in your home right now. 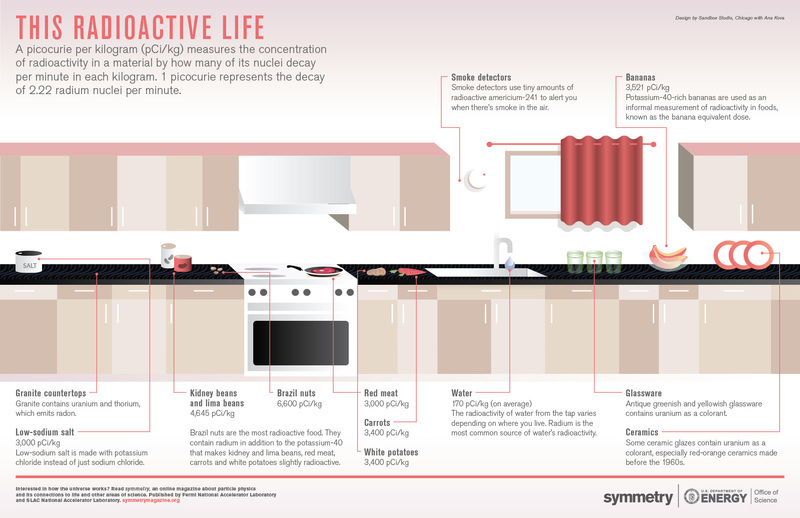 Simply examining the average kitchen, one finds a cornucopia of items that emit enough radiation to detect it with a Geiger counter, in both manmade consumer products and natural foods. Are there Brazil nuts in your pantry? They’re the most radioactive food there is. A Brazil nut tree’s roots reach far down into the soil to deep underground where there’s more radium, absorb this radioactive element, and pass it on to the nuts. Brazil nuts also contain potassium, which occurs in tandem with potassium-40, a naturally occurring radioactive isotope. Potassium-40 is the most prevalent radioactive element in the food we eat. Potassium-packed bananas are well known for their radioactivity, so much so that a banana’s worth of radioactivity is used as an informal measurement of radiation. It’s called the Banana Equivalent Dose. One BED is equal to 0.01 millirem. A typical chest x-ray is somewhere around 200 to 1000 BED. A fatal dose of radiation is about 50 million BED in one sitting. Some other potassium-40-containing munchies that emit radiation include carrots, potatoes, lima and kidney beans and red meat. From food and water alone, the average person receives an annual internal dose of about 30 millirem. That’s 3000 bananas! Even the dish off of which you’re eating may be giving you a slight dose of radiation. The glaze of some older ceramics contains uranium, thorium or good ol’ potassium-40 to make it a certain color, especially red-orange pottery made pre-1960s. Likewise, some yellowish and greenish antique glassware contains uranium as a colorant. Though this dinnerware might make a Geiger counter click, it’s still safe to eat with. Your smoke detector, which usually hangs silently on the ceiling until its batteries go dead, is radioactive too. That’s how it can save you from a burning building: A small amount of americium-241 in the device allows it to detect when there’s smoke in the air. Granite countertops also contain uranium and thorium, which decays into radon gas. Most of the gas gets trapped in the countertop, but some can be released and add a small amount to the radon level in a home—which primarily comes from the soil a structure sits on. Granite doesn’t just emit radiation inside the home. People living in areas with more granite rock receive an extra boost of radiation per year. Yearly radiation exposure varies significantly depending on where you live. People at higher altitudes receive a greater dose of radiation showered from space per year. But not to worry if you live in a locale with lots of altitude and granite, like Denver, Colorado. “No health effect due to radiation exposure has ever been correlated with people living at higher altitudes,” Cossairt says. Similarly, no one has noted a correlation between health and the increased dose of radiation from environmental granite rock. It doesn’t matter if you’re living at altitude or sea level, in the Rocky Mountains or on Maryland’s Eastern Shore—radiation is everywhere. But annual doses from background and manmade sources aren’t enough to worry about. So enjoy your banana and feel free to grab another handful of Brazil nuts. Check out our printable poster about radioactivity.